About ten years ago, David and I took an incredible trip to Nice, France. After a few days of enjoying the sun, sea, and cuisine (including David’s dream of eating bouillabaisse next to the Mediterranean, gorgeous fruits and vegetables, lots of crepes Grand Marnier, rosé, and socca*), we got antsy for a change from the typical French offerings. After enjoying some awesome pizza at a little Niçoise café, we got the grand idea that we wanted to go to Italy for a day trip. The next morning, we woke up early, downed our coffee and walked for about thirty minutes to the Nice train station. When we arrived, we realized that we had just missed the train to San Remo, on the Italian Riviera, and the next would not come for hours (usually they run hourly, but it was a “special schedule” day). We gazed up at the departures board to see where we could take a day trip....we had just arrived the day before from Paris, so that was out. Lyon was out, as well: too far, and we had both visited before. We saw that a train to Monte Carlo was departing in just a few minutes. Disappointed about Italy, and each furious and blaming the other for missing the train, we begrudgingly got on (can you even imagine? Begrudgingly, we got on the train to Monaco!). I’ve never taken such an incredible, gorgeous ride in my life! We were along La basse corniche, a route that runs just about fifty meters above the Mediterranean coastline along the Côte d’Azur. The train looked like a subway train in Chicago, but instead of going through the icky west side, it hugged the side of cliffs as it rambled through the small French coastal towns. The windows on the train were all open (was there any glass?) to let in the fresh, salty sea air, the sea was as blue as you could ever dream, and there was not a cloud in the sky. It was about 82 F degrees, and it was perfect. Seriously. Honestly, it was awesome. And it only took about thirty minutes from Nice to Monte Carlo. Lucky thing that my husband and I were not speaking, or we would have missed all that beauty! But, I digress. This is about a sandwich. Not just any sandwich, but a panini. A panini, as most of you know, is a type of hot, pressed sandwich made in a grill-like contraption called a panini press. The trip to Monte Carlo was so unexpected, and since we had planned to eat pizza and gelato on the Italian Riviera, we exited the train without a clue about where to go. The fact that we weren’t speaking also made for a very difficult time. We did agree on one thing: we were starving. So, we sauntered down to the sea, and stopped at the first place we saw. It was a tiny shack, the kind where you walk inside to order, but have to go outside to eat. I have no idea what it was named. There was a very limited menu consisting of les sandwichs, beer, and wine. We both ordered the ham, cheese, and tomato panini (sandwich jambon et fromage avec tomate). To drink: two bottles of Fischer la Belle beer. The beer came icy, icy cold. The sandwiches came wrapped in paper, and we took them to a small table seated by the marina. Each panini was pressed until the baguette was crispy and hot...inside, a few delicate shavings of ham (jambon) and thinly sliced tomatoes were held together with a bit of oozing melted gruyère cheese. As we hungrily tore into our lunch, all hard feelings disappeared. On that day, sitting on the edge of the Mediterranean, looking out over the marina, in a foreign country (well, principality to be exact), with an ice cold beer...that was one of the best meals I ever had. By far, the best sandwich. Truly, it was amazing. I even felt compelled to go inside and tell the proprietor and his wife this. As I rambled on and on, I could see they were thinking that this poor, crazy American has no idea about food and probably eats only hamburgers (many French think that this is a staple of the American diet)...she has never had a simple sandwich and she has no idea what she is talking about, but they smiled politely and thanked me anyway. Either that, or my French was really, really poor. We spent the rest of the day meandering around Monaco, without really knowing where to go or what to do, so I can’t give you any advice on where to go if you visit. 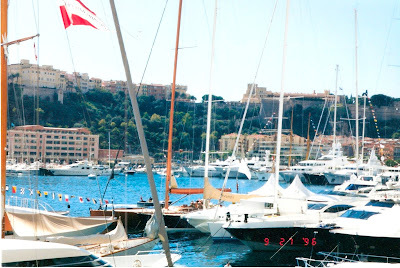 But, I can tell you that if you are ever in Monte Carlo, look for a little shack down by the marina and get the sandwich jambon et fromage avec tomate, and don’t forget the Fischer la Belle. If you are not going to Monaco anytime soon, here is a recipe for making one at home. If desired, add any of the following: mayonnaise, pesto, Dijon mustard, shaved red onion, fresh basil. Heat the panini press until it is very hot (if you don’t have one, you may grill the sandwich like a grilled cheese in a pan). Place one slice of bread on the press, and top first with meat, then tomatoes. Season with salt and pepper, then top with cheese. Place the second slice of bread on top. Drizzle the top of the sandwich with olive oil. Close the grill and press lightly on the sandwich. I like my paninis thin and crispy, so I put a weight (like a bottle of olive oil) on top of the press and let it cook for about five minutes. Adjust cooking time and ingredients for your taste. *Socca is a chickpea pancake that is sometimes eaten in the Mediterranean region. How funny is that- we just missed each other! We were there in September '02. I am glad that you enjoyed the story, and thanks for your comment!